Larry has been licensed since 1968, and enjoys chasing DX, contesting, rag-chewing, working IOTA contacts, and logging TenTen numbers. 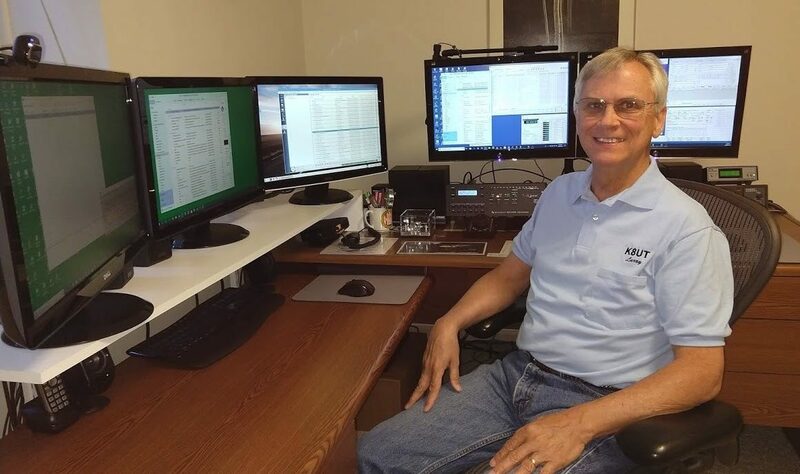 He operates all bands from 2 meters to 160 meters, and his modes of operation include FT8 (his current favorite), RTTY, JT65a, CW, PSK31, and SSB. Originally licensed as WB8BGO, Larry also held the call KE8BF briefly before getting his Extra Class license and the vanity call K8UT. Larry has 338 current DXCC countries worked and confirmed, plus an additional 9 “deleted” countries. He has 9 band WAS (160, 80, 40, 30, 20, 17, 15, 12, 10) and has turned his attention to US states needed for WAS on 6 meters. He has DXCC, WAZ, and WAS in three modes (CW, SSB, and RTTY). Larry has recently purchased a boat-load of LoTW credits, and forwarded forty 160 meter QSLs to the ARRL, which officially qualifies him for 9 Band DXCC (160, 80, 40, 30, 20, 17, 15, 12, 10). QTH – City is HAMBURG, County is LIVINGSTON. Larry’s postal address is the city of Whitmore Lake in Washtenaw County because that’s where the Post Office is. But – for you county hunters out there – his actual QTH is across the county line in Livingston County. In his spare time, Larry writes Ham Radio related software programs on Windows and Linux platforms. His most recent projects include the Mortty CW/RTTY Keyer Kit (www.mortty.info/mortty) and the FreqEZ band decoder (www.freqez.info/freqez). Larry is a member of the N1MM Logger Development Team and manages a number of websites, including N1MM (www.n1mm.com), SLAARC (www.slaarc.com) and SEMDXA (www.semdxa.org).